The cat’s bathroom got upgraded thanks to the CATHOLE. Easy to install, and it came in a sweet box. I was happy this project gave me an excuse to acquire a cheap jigsaw. I’ve already used it for four different jobs; definitely worth the 30 bucks. This closet is gigantic. I love it. We’re only buying toilet paper at Sam’s Club now. How am I going to restore the door to its original form when we move out of this apartment? Eh, I’ve got some ideas. I’ll cross that bridge when we come to it. Update: Here’s a more recent picture, after I painted the wainscoting. That is super-awesome. We are hoping for an attached garage in which to put the litter box. The cathole would be a good alternative, though. . . This is pretty great! We have two cats and I hate that the litterbox is exposed. Even if it is in the laundry room. Nice work and a great blog! What a wonderful idea!! I bet you cat loves it too. That’s pretty awesome. Gives me ideas for when we go back home to NC. I’ve been trying to come up with a better solution than leaving the laundry room door open, and I think you just gave it to me. Where did you find it? 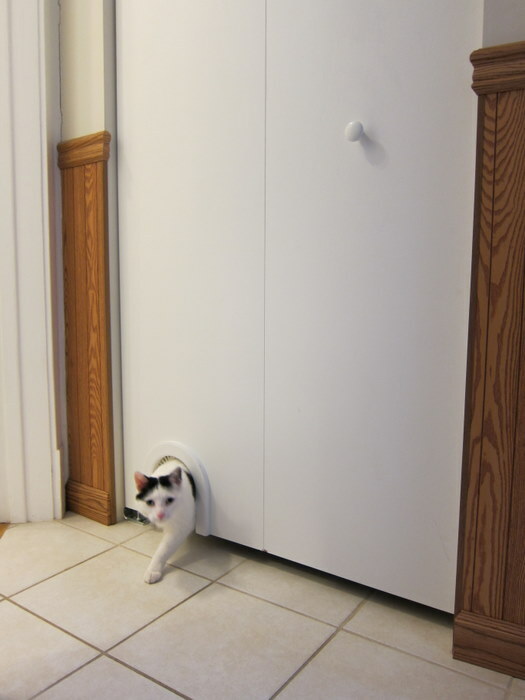 Wow that cat door is super!!! I don’t have a door to use it on but I am going to think of some way because my cat really needs to brushed often and she doesn’t like it. Oh my gosh, I have never seen such I thing! I want – need this. I have three cats and a dog who loves the litter box treats! It’s allways pleasant to meet fellow cat lovers. And living in a place with limited space – i allso read the post about you refurbishing your bathroom – is something people in my country are very familliar with as well. 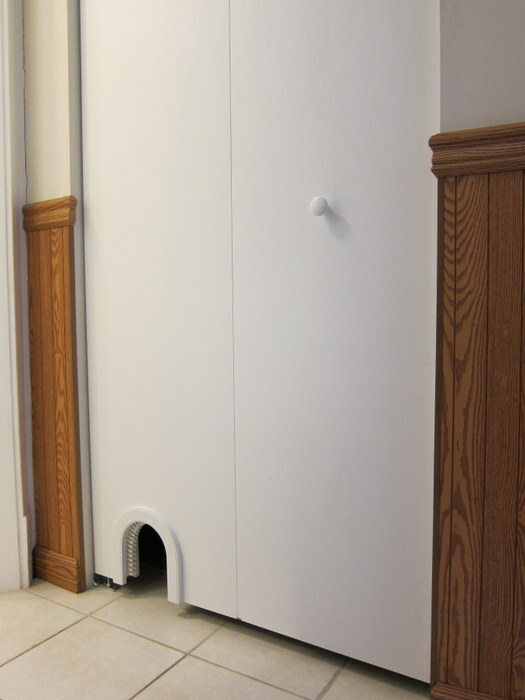 I love the “Cat Hole!” With a sort of plump doggie, I think the cat hole would be a good solution to some problems. :) Thanks for posting – I had no idea this existed. Yep, the cathole is a great invention. I highly recommend it. That’s a clever idea. Not sure my cats would like the brush though. You know, I thought our cats would really like the brush, but they kind of duck under it instead. It’s not a problem though, and it can be removed easily. Thanks for checking out the post! 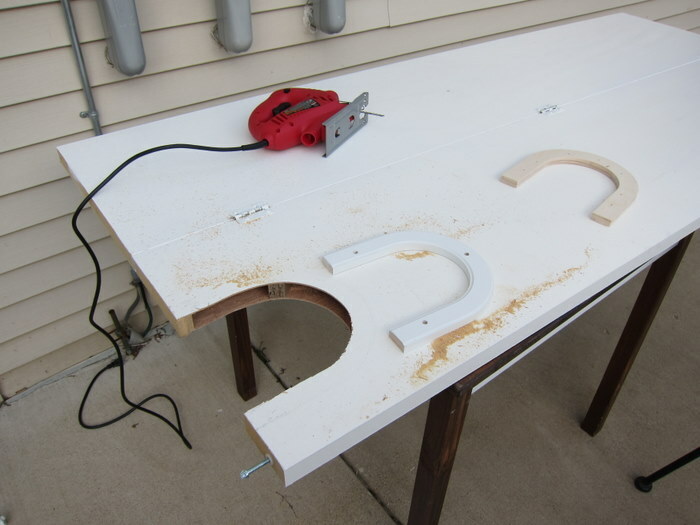 Can I just say how awesome (and responsible) it is of you to keep your cat’s litter box out of sight and also that you have the ability to use a jigsaw to make a cute cat door? 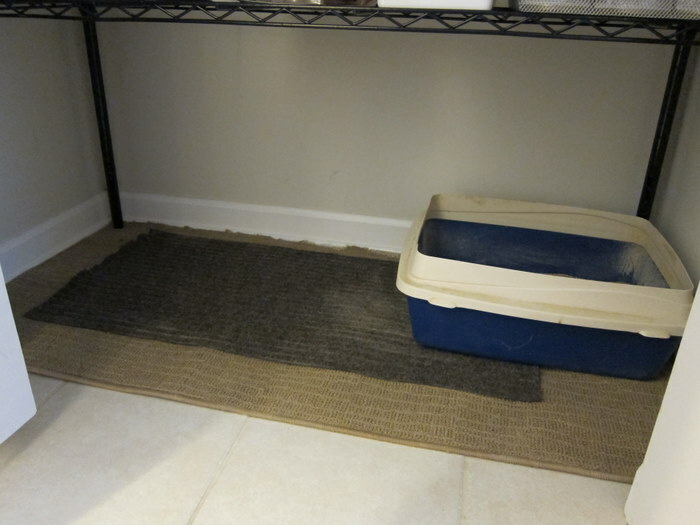 A relative of my bf’s family keeps the litter box fully open (no hood) in the kitchen next to the island, so when you walk around you almost step in the damn box. It’s incredibly unappetizing. Love all the photos you take. I’m getting addicted to your blog here. What a great idea! I’m trying to do something about the litter box too, so trying toilet training the cats. 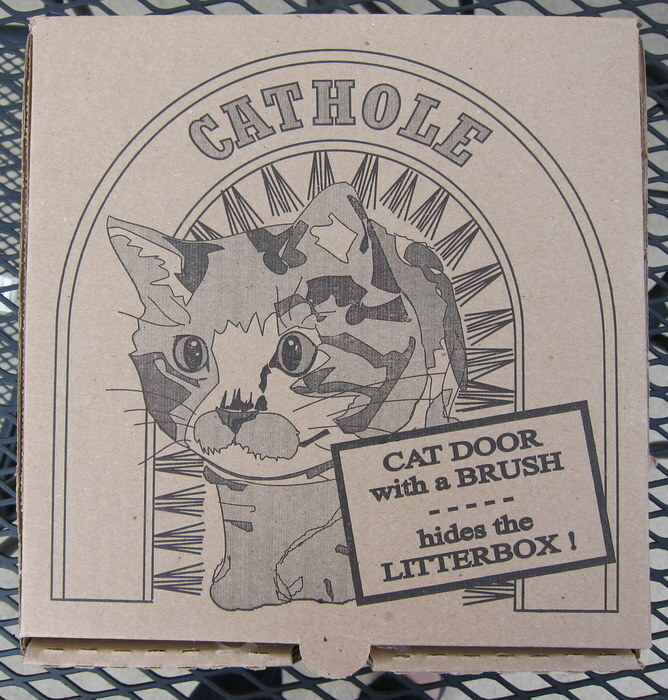 Using the cathole for the downstairs bathroom sounds perfect. But like you, I have to consider what to do when I sell in a few years. Please let me know if have thought about that, beside just buying another door. 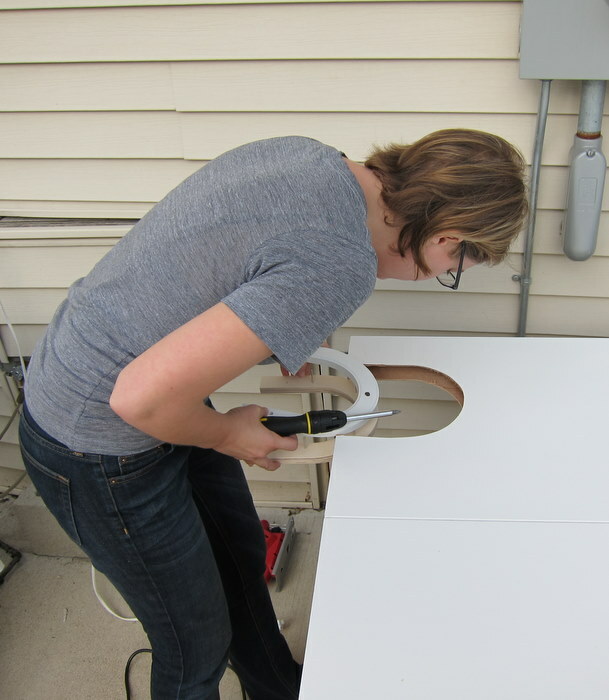 I saved the piece I cut out and I’m pretty handy with spackel, so I think I’ll be able to work something out! When it comes time, I’ll definitely document the repair. Thanks for the comment! pretty well done! 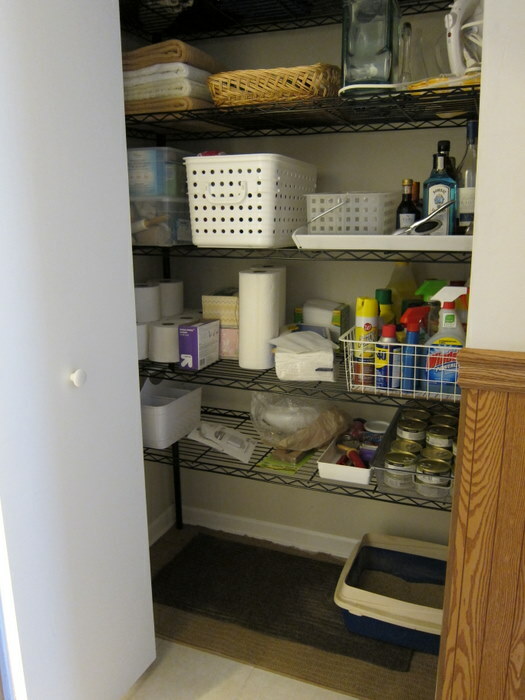 so but you’r not scared that other stuff stored in the room could start to smell like cat-poo? Yeah, that thought has definitely crossed my mind! Our litter box doesn’t really smell – we like our litter brand and we scoop it a couple times a day. My only concern would be the towels we keep in that closet, but we have lots of closet space throughout the apartment, so they could be moved to a non-cat-bathroom closet if needed. That cat hole is a genius idea! Wow, this is awesome!!! Thanks for the idea and link! fantastic! i’m studying how to use such an idea in my little flat. i find it really great and on ikeahackers.net i saw very interesting solutions!